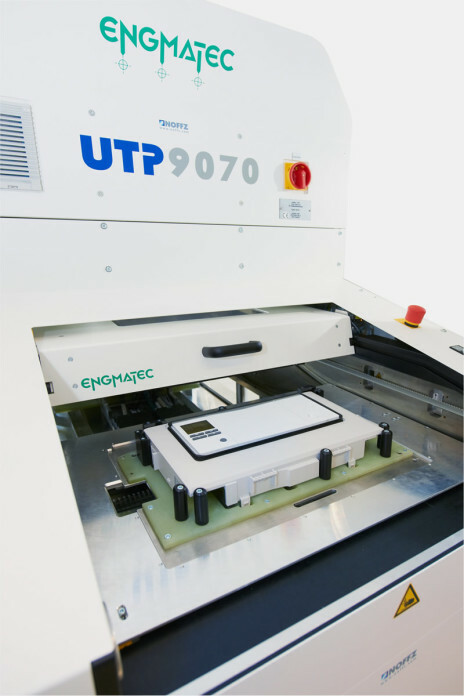 The UTP 9070 is an automatic test stand for functional testing, in circuit, display and haptics tests. In order to offer a fast exchange of the devices under test including short handling times for a high number of units it comprises a tandem shuttle system carrying the devices under test. This system consists of two product carriers moving into opposite directions, so that it is possible to insert a new device while another device is still being thoroughly tested. The test stand can be operated manually by instructed personnel or it can be implemented as an inline system that is operated by robotics. For faulty devices, the test stand includes an acknowledgement system that guarantees that a faulty device is recognized for sure. The electronic devices that should be tested are put onto the product carrier, manually or robotically. Afterwards, the insertion lid is closed. The tandem shuttle system automatically transports the new device into its testing position. At the same time, the second product carrier bearing the tested device is moved back into insertion position and is prepared for removal and insertion of another device. If the device under test has reached its final testing position, the contacting mechanism is moved towards the device and establishes the connection. Afterwards, all required measurements are executed. If the test results have not been satisfying according to the specifications, the insertion lid stays locked until the confirming button for faulty devices has been pressed. 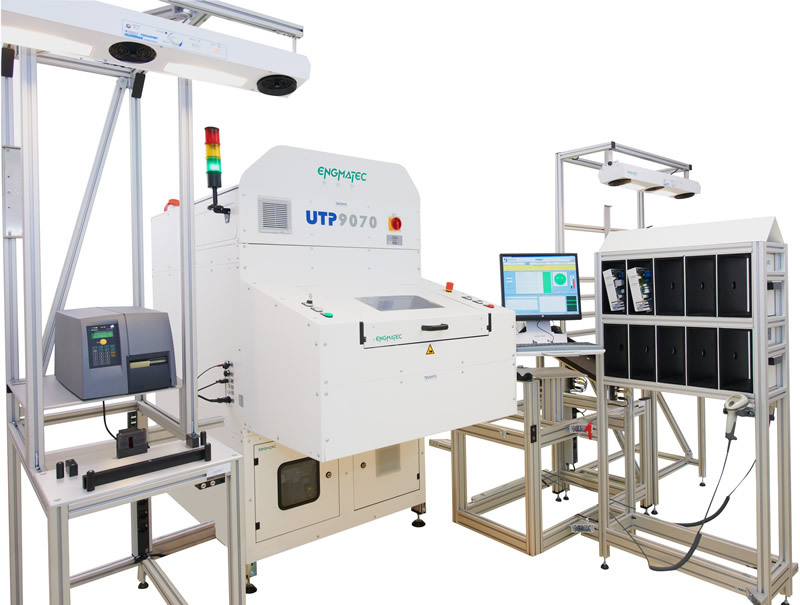 The UTP9070 is an autonomous test stand for ICT, FCT, display and haptics tests, which is also extendable for in-line applications. Because of its tandem shuttle system with two product carriers it reduces handling times significantly and therefore increases the number of units tested considerably.